This beautiful two-seater outdoor lounge sofa comfortable seats two people and fuses together modern style with outdoor comfort. If you want a larger outdoor sofa, please check our Three-Seater Sofa. 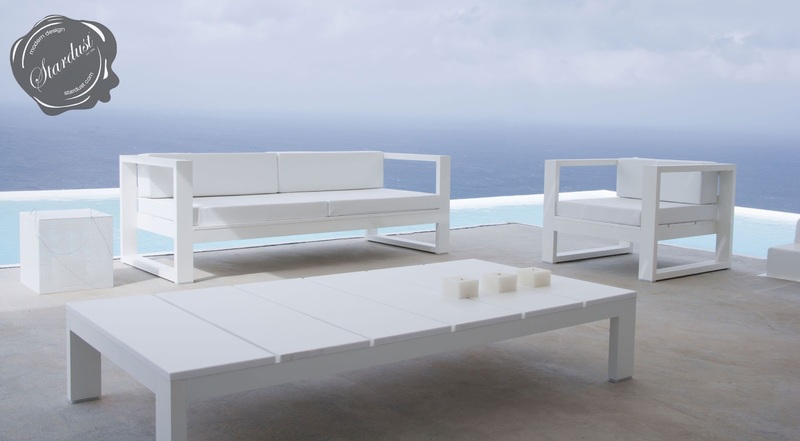 The Na Xemena Outdoor Lounge Sofa was designed by Spanish architect Ramón Esteve for Gandia Blasco in Valencia Spain and is part of the modern outdoor furniture collection from Stardust. Create the ultimate modern outdoor lounging place with this super stylish sofa for the outdoors. This beautiful line of outdoor furniture from Stardust Modern Design makes spending the day or evening lounging outside cozy and comfortable. This beautiful outdoor sofa, with its clean modern lines, provides that extra special modern touch to your private oasis. The Na Xemena Sofa by Gandia Blasco from Stardust was designed with a "less is more" philosophy in the spirit of Mies van der Rohe. With a look that will stand the test of time, this ultra modern outdoor sofa lounge is perfect for use as pool lounge chair, patio lounge and garden sofa. The ultra-strong marine grade aluminum ensures a lifetime of service. A versatile piece of modern outdoor furniture constructed to withstand the elements of the outdoors. 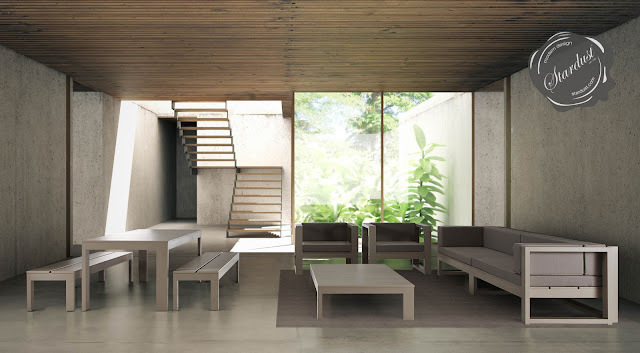 This minimal design chair is perfect for both residential and commercial outdoor furniture applications including patios, pool decks, beaches, resort hotels, spa retreats and more. Relaxing next to the pool side, on the beach or on the patio will be even more enjoyable because of this beautiful outdoor sofa. The Na Xemena Sofa is available in five color finish. The standard aluminum frame with white seating is the most popular choice and is in stock for immediate shipping. Other color combinations may have a lead time. Seat cushions are optional and are available from Stardust Modern Design at an additional cost.